The final game of day 1 saw our team play into Team Misfit Toys, which was basically a team comprised entirely of our friends. Chandler got to play into his former co-host Dan Yount, Bret dropped into Tseung Tsu who many of you know from his excellent podcasts and lots of written content here on LoS, and I found myself playing Matt Zelus. He had Skarre 1 Dark Host and Skarre 3 Slaughter Fleet Raiders, and into both of those I was dropping Grayle. 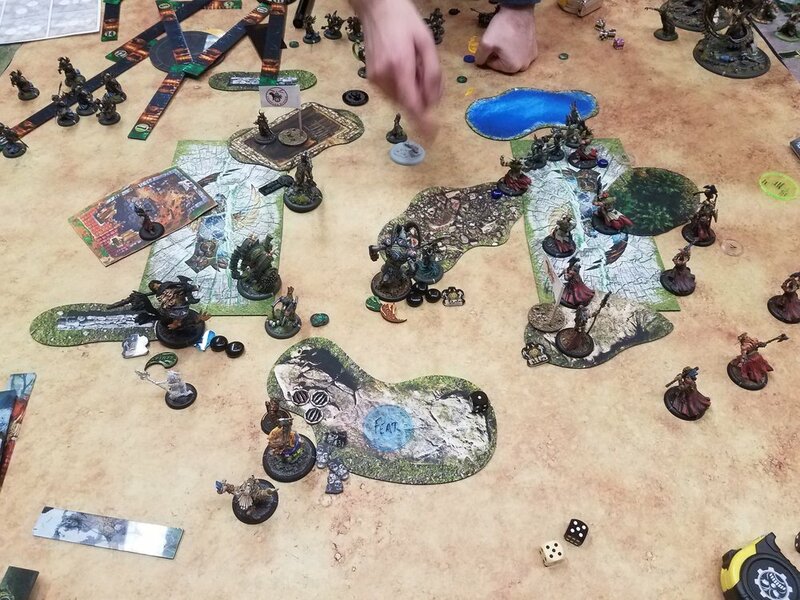 He dropped Skarre, I won the roll off, and opted to go first. Prey went on the Inflictor and my Weavers opted to Ambush. Everything runs up to just outside of the Stalker’s threat ranges. The Spirit Cauldron fills up Lord of the Feast, who is also Storm Ragered by Grayle. I make a positioning error here and do not leave the Ravager Shaman within 14 inches of Ghetorix so that I can apply magic weapons to him. In a maneuver that I had not expected but that Matt has surely practiced, the Wraith Engines ran base to base with the objective. His Indictor ran up between them and then got bubble wrapped such that Lord of the Feast could not be placed if the Inflictor shield guards the Raven. 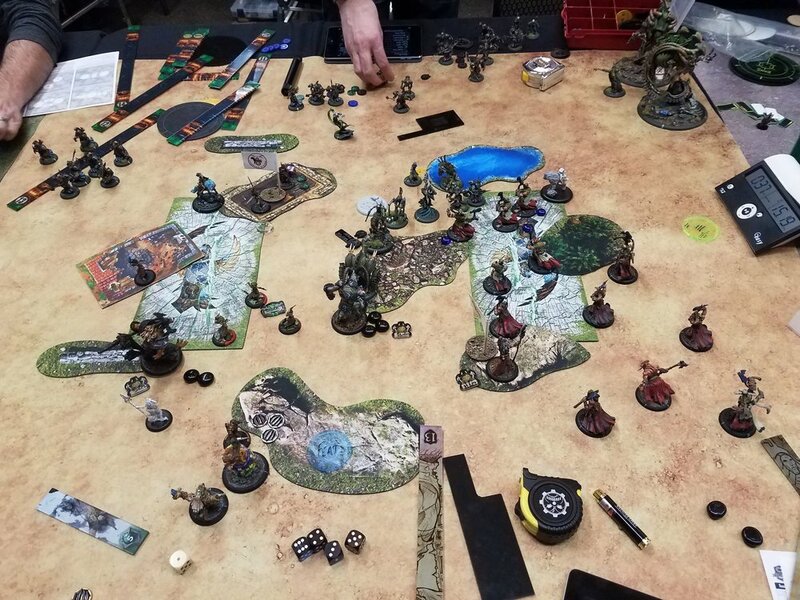 All of the important pieces ran up behind, with Darragh putting up Mortal Fear, and then the Bane Knights fanned out on the sides to screen there. Ghetorix didn’t have a prayer of getting into the Wraith Engine with magic weapons, but Lord of the Feast was in charge range, and my eyeballing instincts were telling me that Darragh Wrathe was too far back from the left Wraith Engine to protect it from every angle. A couple of quick measurements later confirmed this gut feeling, so my Weavers ambushed left and ran in so I could sacrifice them for Divine Inspiration. Lord of the Feast, with all the buffs, charged in and single handedly killed the left side Wraith Engine with a corpse to spare. I did the math after the game, and the odds were in the high 90% range. Brighid and Caul got Magical Weapons and charged into the other Wraith Engine, and although they also had a high 90% chance to kill there, the dice did not cooperate so I did not instantly win the game on the spot. Wolf Rider Champs killed a Bane Knight apiece and repositioned out of harms way. Everything else braced to take an alpha. Bane Knights charged into Lord of the Feast and trivially removed him. Skarre popped her feat, getting Tarturus, Darragh, the Wraith Engine, and her entire battlegroup. She cast Dark Guidance and camped 6 (he rolled six for Ritual Sacrifice every turn). The Wraith Engine charged through Brighid and Caul and killed two Ravagers, spawning a Machine Wraith. The Machine Wraith charged and killed my Gobber Chef. Darragh put up Mortal Fear in the middle of the table, and the Inflictor ran up to threaten Grayle. The Banes swarmed up behind the Wraith Engine on the right, and Matt scored a point for having Skarre on the flag. Things start off a bit whacky as the Wolf Rider Champion charges the Wraith Engine in the back arc. The Impact attack does a couple damage to it, dropping it to 9 health, and then the charge damage roll is 6,6,6,5,5, doing 14 damage at dice off 14 and dropping the giant thing. Grayle moved over, put Storm Rager on the Nightwitch, and Feated. The Nightwitch got Divine Inspiration from the Blood Shaman. Wolf Rider Champion #2 killed three Bane Knights, which let the Night Witch move into charge range of the other seven. 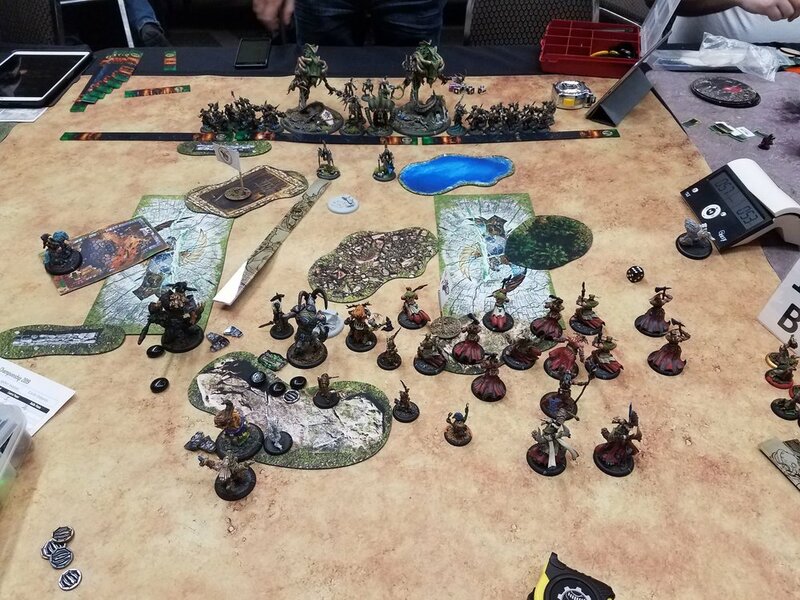 She surfed happily through the entire unit, ending on the flag next to Skarre and actually scoring it for me since there was nothing else to contest. The Shadowhorn bravely moved up to body block the Inflictor, and Ghetorix moved into the left zone out of range of the Stalker, putting up Spiny Growth as well. On the right side, the Ravagers had a devil of a time with the effectively ARM 22 Knights, but enough boosted rolls ate through the majority of the unit. The Bloodweavers ran up to make it more difficult for the Inflictor to get to Ghetorix. I moved up the Ravager Shaman onto the flag with Hunters’ Grace up, and scored three points to nothing. Neither one of us had expected quite as much damage, and Matt felt he had to start making some desperate plays. Grayle was just outside of the Inflictor’s charge range, but Ghetorix sure wasn’t. A Stalker seriously messed up the Shadowhorn, but it lived through the attacks with about 10 boxes to spare. Darragh charged and killed a Bloodweaver, shooting another with a Hellfire. 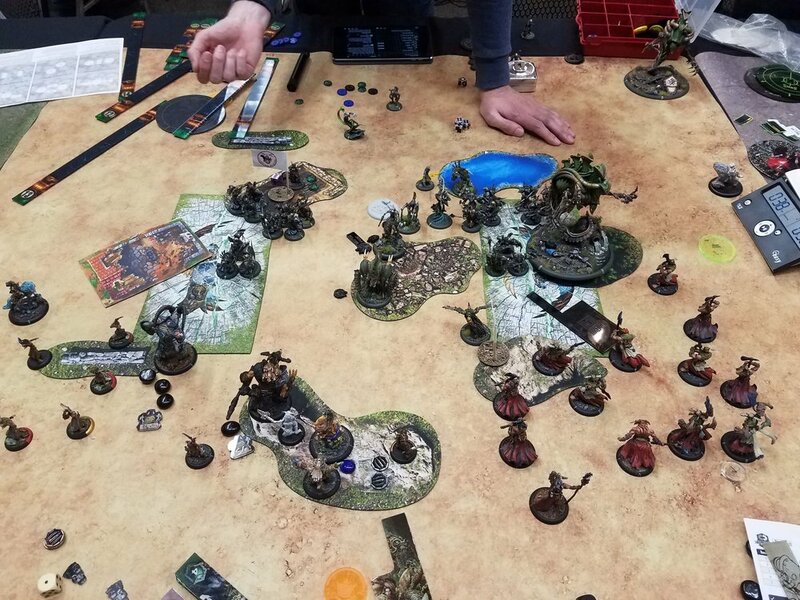 Skarre had to come off her flag to kill both contesting solos, which was a little awkward, and the Inflictor was finally able to charge Ghetorix after the other Stalker had to kill the final Bloodweaver in order for it to get the angle it needed. Ghetorix stoically refused to die, and after looking at the table for a few moments, Matt conceded as I was surely going to kill everything left on the table the following turn. Lord of the Feast in this list is an absolute monster. Storm Rager really tilts the math of the things he can kill in one turn. Matt’s play on turn one would have been fantastic if I didn’t have access to that hitting power, and in fact I don’t know what many lists do in that situation. The Bloodweaver Nightwitch got a chance to kill things other than my own models for once, which was very nice. She takes Storm Rager extremely well, and her native weaponmaster feels like a good change from her previous boosting mechanic. Ultimately, our team won this round 3 - 2, coming back from a very fast 0 - 2 deficit as Bret, Nathan, and I won our games. Stay tuned for the final round!